ABOVE)One early idea was that because Pitch needs to work in the dark, he would harpoon the moon in order to lock it in place and block out the sun (at least on part of the earth). There would also be a literal man in the moon who Pitch would want to destroy. Well those two ideas inspired me to create this image. 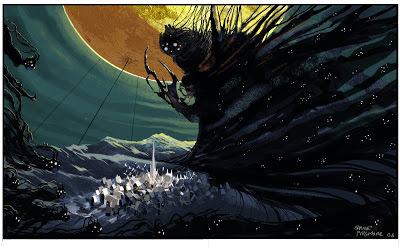 “What If” Jack could now run up a harpoon chain (in a very fantasy driven way)to go help the man in the moon himself? ABOVE)An early idea that Santa (who Joyce always invisioned as an old warrior type)would try to keep Pitch at bay (on Pitch’s flying nightmare galleon. yes, Pitch had a flying ship at one point)in order for Jack to focus on making it snow in every child’s room below. Thus, inspiring the children and weakening Pitch. 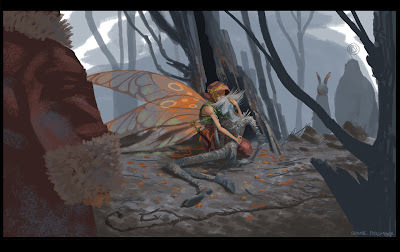 ABOVE)Bunny and The little tooths (fairies)come to Jack's aid as well. ABOVE)Here I was trying to portray Pitch as an absolute, supernatural force of nature. Growing in strength and size as the children in the town below grow more and more fearful. 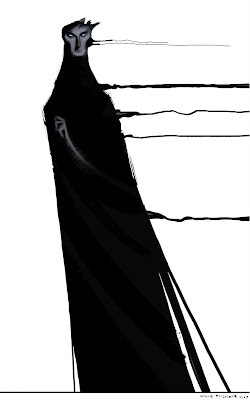 Pitch's "Nightmare Men" swirl and multiply to add to his horrific form. (the night"MARES" were a later invention). ABOVE)How would Jack Frost prove he is worthy of becoming a Guardian? What would he sacrifice for the children and for the team? We were not completely sure yet, but I created this exploratory image to help inspire potential answers to that question. Much more on the development of Rise of the Guardians to come. This Thanksgiving The RISE of the GUARDIANS opens in theatres everywhere. I had a great deal to do with nearly every aspect of the development, green light, and early production of this film, wearing many hats along the way. Over the next couple of months I will be sharing much of my experience as a development artist, story artist, and designer throughout the production. Above is one of my later development pieces of the villain, “PITCH”…the“Boogey Man” . Here I was playing with the idea of Pitch having to manifest/pull himself out of the darkness to take a brief, and eerie "human" form. I pushed hard throughout the entire development process (from late 2007) to not just treat Pitch like a dude in a costume, but only have him take a somewhat "human" form when needing to coerce or deceive (more on that later). In the end I lost that battle and the Pitch in the final film ended up being very much a dude in a costume. Making films is a long process with countless twists, turns, debates, and decisions along the way. This film was quite an adventure, and I will share much more on the overall development of The RISE of the GUARDIANS in the weeks and months to come. Happy Holidays all! DEVIN CRANE is one of the most accomplished artists I have ever known. He has been working in the animation industry for the past 18 years at many studios such as; Disney, Sony, Warner Bros and DreamWorks as a story artist, development artist, character designer, and animator. He also shows his fine art paintings in galleries around the world (some examples above)! I have known and been friends with Devin since highschool, and have been lucky to watch him on every step of his artistic journey. Now I am happy to announce that Devin has just created a new blog, so the rest of the world can watch Devin as he embarks on many more artistic journeys in the future. Check it out and enjoy! A while back I posted about a very special project that I was asked to take part in (the images above were created back then). 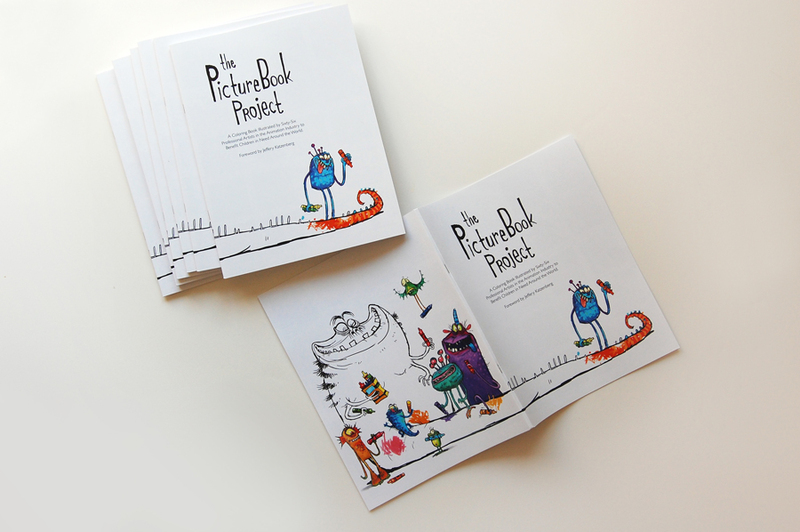 Well now THE PICTURE BOOK PROJECT COLORING BOOK is making its debut at the CTN EXPO this Sunday, November 18th. 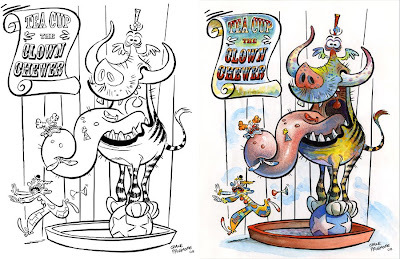 Dreamworks animation artists Rachel Tiep-Daniels, Margaret Wuller and Pixar producer Karen Dufilho-Rosen have collected illustrations by sixty-six artists from the animation community to create this unique coloring book to raise funds to support kids cared for by orphanages in Ghana West Africa. 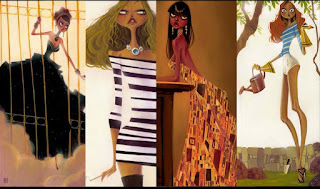 Cartoon Brew wrote a great story about the book and the event HERE . 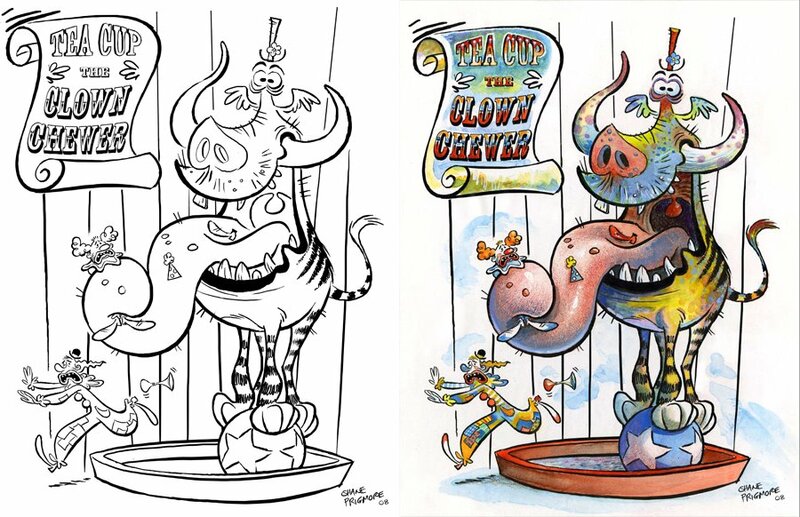 The theme(s) the artists were given to create the artwork for the Coloring Book was: “CIRCUS SIDESHOW” and “WEIRD CREATURES”. I combined the two ideas(above). Myself, and several other contributing artists will be at the CTN EXPO this Sunday November 18th from 11:00 AM to 1:00 PM to sign copies of the book and say hello. Stop by and support a fantastic cause !